Royal Caribbean Alaska Cruises for 2014 will see two ships offering itineraries to Alaska in the summer of 2014. One way departures are available southbound from Seward or northbound from Vancouver, Canada on 7 Day Alaska Cruises perfect for that on your own or guided tour of interior Alaska. There are car rentals, motorcoach and Alaska train tours all available from Seward Alaska. Radiance of the Seas offers these popular seven-night itineraries between Vancouver Canada and Seward, Alaska. 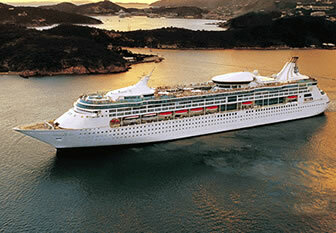 Rhapsody of the Seas offers round trip Alaska cruises from Seattle Washington. These 7 day roundtrip Inside Passage voyages depart Seattle on Friday afternoons returning the following friday morning to Pier 91 in Seattle. These cruises visit Juneau Alaska, Skagway Alaska, cruise in Tracy Arm Fjord, Inside Passage cruise and Victoria, Canada before returning to Seattle WA. Royal Caribbean also has combination land and sea Alaska cruise tour options that combine well with the Radiance of the Seas itineraries between Seward Alaska and Vancouver, Canada. Cruising Alaska's Inside Passage with visits to Skagway Alaska, Tracy Arm Fjord, Victoria, Canada before returning to Vancouver Canada. This cruise also sails inside of Vancouver Island, an area known as the Inside Passage of Canada. All 2014 Last Minute RCCL Alaska Cruise Deals from Seattle and Vancouver are updated daily! Last Frontier Cruises has unbeatable specials on all cruise deals from Seattle. The best Alaskan cruise prices on 7 day RCCL cruises and round trip voyages for 2014. Unbeatable RCCL Alaskan Cruise deals 2014 and Discount 2014 Alaska Cruises updated between 9am and 5pm daily.